Land Rover has created a special bespoke Defender to carry the Rugby World Cup 2015 trophy. The Rugby World Cup 2015 Defender is a modified 110 station wagon created specially to transport the Webb Ellis Cup some 9,000 miles on the 100-day Rugby World Cup Trophy Tour across Britain and Ireland. Land Rover is a worldwide partner of this year’s Rugby World Cup and has created the special Defender as a worthy custodianship of rugby’s most instantly recognisable icon. The specially-modified 110 Defender station wagon was developed and built by Jaguar Land Rover’s special vehicle operations division at its headquarters in Britain, and took nearly 6,000 hours to design and build. 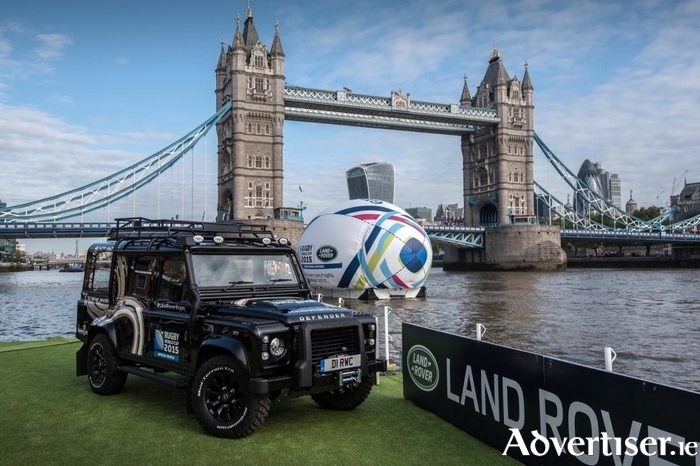 The special Defender made waves when Land Rover unveiled the vehicle in spectacular fashion at Tower Bridge in London where it emerged from a giant rugby ball, driven by Land Rover Ambassador and Rugby World Cup 2003 winner, Lewis Moody. The 8.2m high ball floated 25 miles up the River Thames from Tilbury Dock, passing iconic London landmarks such as the Thames Barrier and Canary Wharf along the way. The focal point of the Rugby World Cup 2015 Defender is the bespoke trophy cabinet to the rear of the vehicle. A one-of-a-kind Rugby World Cup 2015 Defender App has been developed specifically for the purpose of controlling the high-specification technology within the trophy cabinet – making sure that conditions are just right. Lighting and the locking mechanism that secures the Webb Ellis Cup and a 40-inch Toshiba TD-E display are controlled through the App on a 10-inch Toshiba Encore 2 tablet which acts as the interface. Canon LEGRIA mini X camcorders have been embedded into the vehicle for the purposes of capturing the trophy’s epic journey in full HD quality. The trophy cabinet is also protected with toughened security glazing. The climate control system is crucial to ensuring the trophy is always the star and visible to fans throughout the tour. It maintains a constant temperature within the cabinet to eliminate fogging and is aided by anti-glare security glass. To add a touch of theatre, three different lighting modes have been incorporated, while the Toshiba screen will display a host of memorable moments from rugby’s illustrious history. The passenger interior is based on the Defender Autobiography edition and offers a high level of personalised design touches. Black Windsor leather seats have been embellished with gold contrast stitching and Rugby World Cup 2015 blue piping, while the contrast stitch extends to the dashboard and doors. The Rugby World Cup Trophy Tour logo takes prominent position being embroidered onto the front headrests. Powered by Land Rover’s proven 2.2-litre diesel engine and six-speed manual transmission, this iconic all-terrain vehicle also features a front winch, aluminium sump guard, side and rear steps, modified raised air intake and expedition rack. These are complemented by striking Rugby World Cup 2015 graphics to the exterior. Vehicle spot lights illuminate the immediate surroundings like a floodlit pitch while the broader 16” off-road tyres give the Defender a purposeful and self-assured stance. Land Rover says the tour reflects the Defender’s legendary "go anywhere, do anything" character as it carries the Webb Ellis Cup to some 300 events in 100 days and engages with fans and players at all levels. The tour kicks off on June 10 and will culminate on September 18 at the Rugby World Cup 2015 opening ceremony at Twickenham Stadium. The Rugby World Cup Trophy Tour Defender will continue to transport the Webb Ellis Cup throughout the tournament, which takes place across 13 stadiums in Britain until the final on October 31.